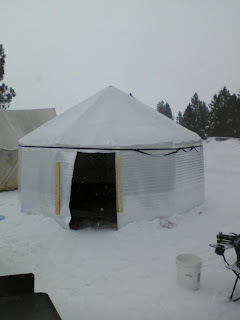 Initially, I built a "hexayurt" out of 7/16 OSB sheathing. I ended up taking it apart and rebuilding it at least three times. It's finally evolved into a very functional milking shed. I also put together a "stretch hexayurt" from 1" foam panels and most recently, a more portable yurt with a wooden frame and a flexible insulation covering.